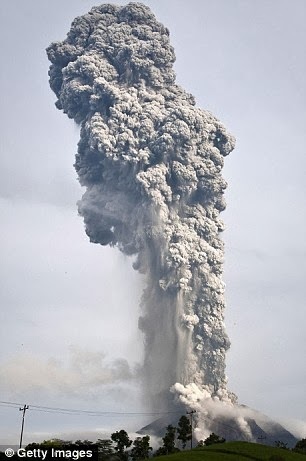 It is a horrifying site in northern Sumatra as Mount Sinaburg has been erupting since Tuesday and spewing rocks and lava almost four mile up in the air. Already, More than 5,000 people have fled their homes in western Indonesia in recent days following a series of violent volcanic eruptions. Although the government has called for people living within 1.9 miles of the volcano to be evacuated, those living beyond the danger zone were also fleeing their homes.